SolairForce insulation can significantly reduce energy costs and greenhouse gas emissions, with a range of products available to match different roof profiles in residential, commercial and industrial buildings of all sizes. This advanced insulation product was designed to offer flexibility for a range of applications. 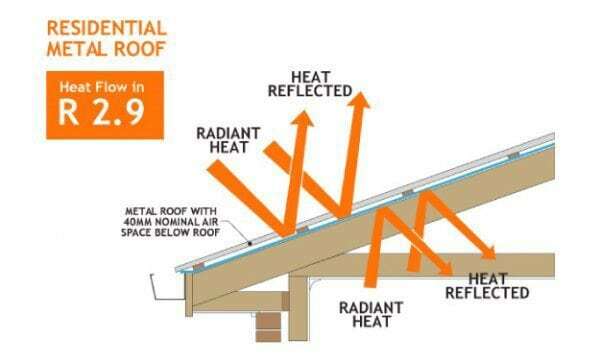 Comprising two reflective aluminium foil surfaces with an air pocket in-between, the transfer of heat is greatly reduced when SolairForce rolls are installed in roofs and other locations, helping to reflect sunlight in summer and prevent heat from escaping buildings in winter. This insulation product is easy to install DIY and is guaranteed to last for many years, with a 20-year warranty. SolairForce is made from a strong 4mm thick polyethylene cell structure that separates two highly reflective layers of polished aluminium foil. SolairForce is our most lightweight product, which means easier installation, more efficient construction, and bigger cost saving. The lightweight construction of SolairForce means highly efficient insulation is installed that does not consume valuable space within the building envelope. SolairForce is designed to replace conventional insulation such as bulk insulation blanket, ceiling batts, and cellulose fibre, with a safe, clean, fibre free alternative for use in residential, commercial, industrial, steel, and wood construction. Suitable for use in roofs, walls, and under floors, SolairForce Building Insulation offers an all-in-one package.